KEY: It is good to begin well. It is even more important to finish strong. How do we climb out of tragedy? How can we live on when our present hopes are dashed? Once in a while, a movie comes along that tugs hearts, moves souls, and unleashes tears. Such a movie will not just be a story, but a realistic portrayal of a real life event. Helmed by two very experienced actors, this film brings to life the tragedy, the pain, and the suffering endured by a couple who lost their youngest son in a horrific car accident. On February 2006, Luke Abbate was a backseat passenger catching a ride from one of his teenager friends. In a moment of teen foolishness to show off his speeding ability, the friend driving the vehicle lost control and the car ended up a mangled wreck, killing all but one. After 24 hours, due to excessive brain damage, doctors declared Luke brain dead and were legally allowed to take Luke off life support. Luke was 15, full of potential, mostly unrealized. Instead, it breaks the hearts of the family into a million pieces. The end of one life, only begins the journey to darkness for the remaining members of the Abbate family. Steven and Maryanne lost their youngest son. Rachel, Jonathan, and Adam lost their little brother. As a viewer, I lost my fight against tears. It has been a long time since I felt that way. The film is chock full of incredibly moving scenes. At the hospital, personal friends, schoolmates, teachers, teammates, well-wishers from all over lined up with a powerful demonstration of solidarity and support. Family surrounded Luke with prayer vigils, with the Maryanne praying and reading from the Bible, toggling between faith and fear. Just after doctors pronounced Luke brain-dead, a representative from "Donate Life" came to ask the family for permission to find recipients for Luke's body parts. As if one spin was not enough, the family now had to grapple with another. Once calm presided over the mayhem, the family remembered Luke agreeing to donate his organs not too long ago at a government office. Very quickly, once the father agreed to the organ donation, five recipients had already been identified. I watched the movie and thought about the many beautiful themes spread throughout the movie. The number "five" is prominent as well. Let me offer five themes to take home. Pain can come at us, whether we are directly responsible or not. Luke Abbate on that fateful day could have simply said 'no' to his friend offering him a ride home. After all, he can always call his mother to pick him up from school that day. Yet, for some reason, he gives in to his friends enticement with fatal consequences. If we put ourselves in the shoes of the Abbates, we will have tried to reason it out, that Luke could be alive today, if he had just said NO! The scenarios can be repeated over and over. The probabilities can be calculated time and again. The regrets can also be felt repeatedly with thousands of "if-only" combinations. But will that help? The reality is, what had happened happened. It is easy to blurt out "Do not cry over spilled milk." Living the consequences is long, dark, and often unknown, something that Maryanne the mum had expressed very well. ...I suspect that the journey will be both dark and hard. Our lives have been shattered (breaking) into a million pieces. And I have no idea how to put them together again. Luke was and always will be deeply loved. And now, now, he will be deeply missed." This is followed by another moving scene by the father, Steven pushing and crying as he single-handedly pushed the casket away. As I watch the movie unfold, I notice that there are no scenes of the family cursing and swearing at the family of the foolish driver. There are no moments of hatred for people. There is one single goal: Mourning, crying, and praying. Finishing strong means recognizing that our past is past. The past cannot be allowed to drag us and remain in the mud of life. We need help to get out of the mud of the past. Billed as a film in the tradition of the Blind Side, the movie has several scenes of praying and Scripture reading. There are prayers just before the start of each game. There are honest questions of why God will allow bad things to happen. There are prayers uttered with Scripture. I remember hearing twice the reading of Ps 27:13-14. Aptly chosen, it is an expression of hope during times of hopelessness, knowing that only God understands exactly what the family is going through. God is good. God is faithful. The pain will remain, but the knowledge that God's presence is near will remain stronger still, through the support and encouragement by friends and loved ones. I see how the coaches and staff at Wake Forest University come alongside Jon, caring and giving Jon space to grieve. Jon, being a rising football player for the college team is poised for stardom. He just needs the time to grieve. Graciously and generously, Jon receives lots of space, and lots of time to just grieve. Yet, grieving is tough. Back home, as if one loss is not enough, amid their grief, the husband and wife relationship begins to break down. Steven buries himself in work. Maryanne suffers alone. Both have become too weak to support each other. If grieving is dark and hard, grieving alone is darker and harder. Grieving is necessary, but grieving together is even more necessary. During such tragic times, families must come together as often as possible. If one loses a family member, the rest of the family must learn to come together quickly, decisively, and be in unity with one another. Health experts have noticed that divorces are particularly high for couples who lose a child. 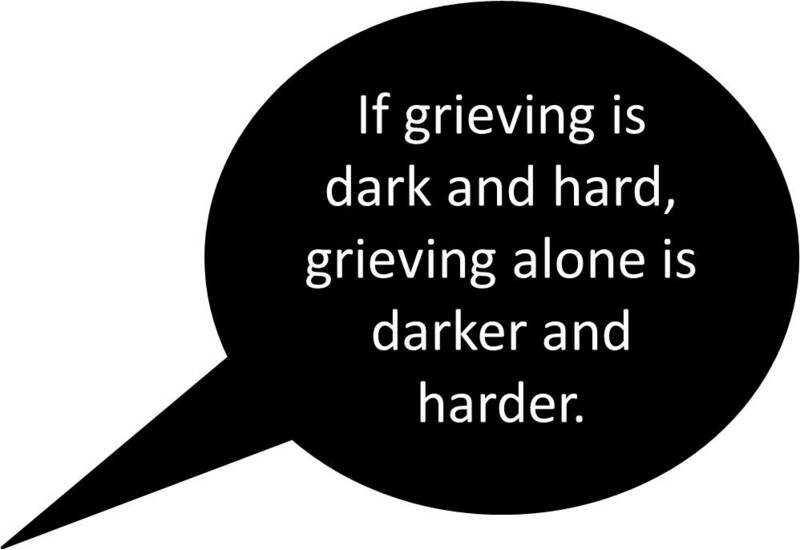 Finishing strong begins with a desire to grieve in a way that is constructive, not destructive. The number "5" is highly symbolic in the movie. Remembering that Luke used to wear the number 5 on his football jersey, older brother Jon got permission to change his own jersey number from 40 to 5. At the same time, during each football game, Steven and Maryanne hold up all their five open fingers in an outstretched fashion, as a symbol of family solidarity. This soon catches on with both supporters, fans, even opponents, who remember the life of Luke Abbate. Amazingly, Jon becomes the inspirational leader as well, rousing his teammates to come from behind in several crucial games to win at the final quarter. Due to the amazing finish by a team that was ranked last in the minds of the public media, Wake Forest's Demon Deacons came to win and finish strong every final quarter, topping their Atlantic division, and eventually winning the 2006 State championship, defeating Georgia Tech at the finals. It is an amazing achievement for the school which has never won a state championship in its 172 year history. Symbols are important in life. For Christians, the most prominent symbol of faith is the cross. There is no substitute, for in the cross, we see how the person of Christ has died for the sins of the world. With one act of obedience, and the complete fulfilling of the will of God, the cross stands as a powerful symbol of reconciliation. Vertically, at the cross, man gets reconciled with God. Horizontally, man is able to be reconciled with one another. A symbol can be a powerful aid to help us finish strong. Starting well is important. Finishing strong is even more important. For it is not the initial performance that will win games. It is the set of final and finishing touches at the last quarter that will lead the team to victory. 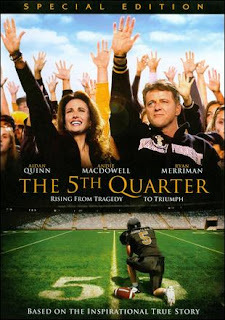 The film is called the Fifth Quarter simply because in many of the games played, Jon Abbate's team came up on top after overcoming very tough opponents. In the game against Duke's Blue Devils, Jon found his team down by 10-0 at halftime. Eventually, the Deacons caught up, and were leading by 14-13 with just six seconds remaining in the game. The problem is, their opponents from Duke had a significant advantage as they have a free kick that if converted, will win the game for Duke. Thankfully, it was blocked and Wake Forest savoured the close win. Wake Forest may have started badly, but they ended strong. Strong finishers win competitions. In the Old Testament, we see several examples of people who had started well but fumbled at the end. Think of King Solomon who began with much fanfare and wisdom. His prayer at the commissioning of the Lord's temple remains a model for all of us to learn. The proverbs often attributed to Solomon have also been used for centuries in daily living. Unfortunately, through a series of missteps and utter foolishness, Solomon fumbled after the glorious beginning. In just one reign, Solomon manages to unravel the good work of his father David, causing havoc to his own personal and spiritual life, but also the split of Israel into two separate nations: Israel on the North and Judah to the South. Strong starts may wow audiences, but strong finishers win games. That is true in life too. "The LORD is my light and my salvation - whom shall I fear? It is the Word of God that will help us to start well, to strive faithfully ahead, and to finish well.In life, we too live lives of four quarters. Suppose the average life-span for us is 80 years. Quarter 4 - Years 61 to 80. We do a lot of absorbing and taking of stuff in our first 20 years. We learn. We study. We take in all that our parents, our teachers, and what society offers. In our next quarter of life, we venture into young adulthood. We graduate with our first degree. We get our first real job. We marry and start our families. We busy ourselves with work and more work. By the third quarter, some of us will have been promoted to higher levels in our organizations or social levels of importance. For others, retrenchments and unemployment will prove to be tough setbacks to our game of life, struggling to play in the challenges of the second quarter with a body made up of the third, even fourth. Then, we reach the final quarter. We begin to think about the meaning and significance of life. In First Things First, the late Steven Covey has helped many people with his four things in life: to live, to learn, to love, and to leave a legacy. Leaving a legacy will very well appear to be at the final quarter of our lives. That we live, we love, and we learn in a way that leaves legacies for future generations. It is a good start, but does not necessarily mean a strong end. Let me put forth one more L to help us finish strong: Longing. If there is one word to describe Ps 27:13-14, it is longing to see God's goodness on earth as it is in heaven. It is longing for the LORD that causes one to wait earnestly for a glimpse of God. It is learning to be strong at heart knowing for sure that God will come, and to wait patiently for God who will definitely come. Longing for God is one of the best signs of a growing Christian. It is this longing for something better that propels people at a funeral to move ahead. This longing gives them hope that one day, all will be well. This longing enables them to gradually move beyond the darkness toward the light. This longing, supported by symbols of hope, will sustain not only the toughest points of life, but the entire journey. As one longs for God, in some very strange way, God teaches us what life is about. God shows us what love is like. God reveals to us what we can learn. Gently and surely, God unfolds the legacy that Christ has left behind that he has finished what he has set out to do. 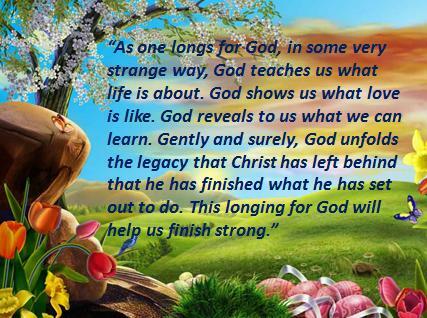 This longing for God will help us finish strong. Let me close with these words from the late Brennan Manning. I want to add. Not only is our faith started in Christ Jesus, it will end in Christ Jesus. For at the Cross, time stands still, and lifts us up toward an eternal God, where time has no hold. Man in Christ gets reconciled with God, and finds that only God is able to reach out and touch us. We who have "eternity in our hearts" can only be truly filled by God who is eternal and everlasting. It is because of a sustained longing in Christ and for Christ, that makes unceasing prayer always possible. Toward the end of the movie, there remains one final scene which made me cry. A survivor with the heart of Luke Abbate was shown standing there, allowing Steven the father to hug and listen to the heartbeat. The memory of Luke does not just live on, it beats on in the heart of a survivor. Luke did not just finish strong. He finishes strong in the heart of another person. Should I Cut My Cable TV?